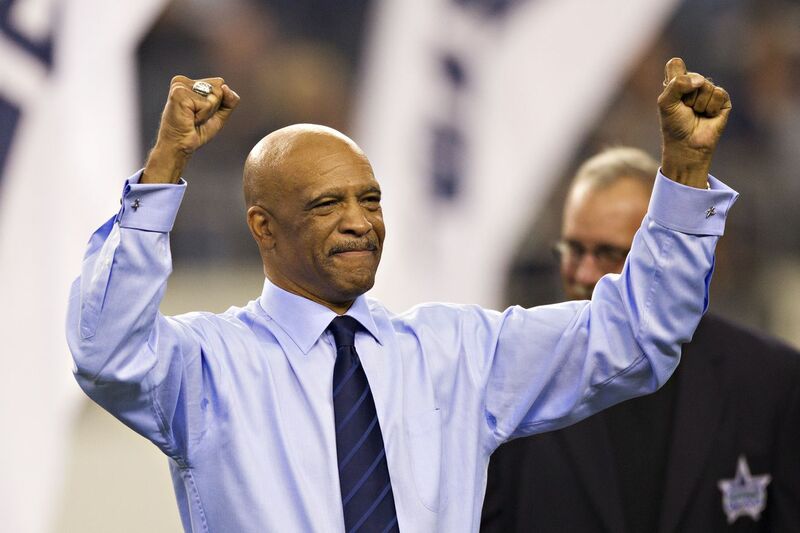 Should Drew Pearson get the ultimate honor? A great injustice was righted a week ago when it was announced that longtime Dallas Cowboys executive Gil Brandt was part of the Pro Football Hall of Fame Class of 2019. Mr. Brandt is responsible for so much of the NFL that we love today and football immortality is what he deserves. He had to wait longer than he should have, but at least he’s going to get in at long last. There are unfortunately a lot of worthy HOFers that are still waiting on the call to get their bronze bust and gold jacket. During a sit down interview with Steve Wyche, various members of this year’s class gave their thoughts on someone who they believe should join them in Canton in 2020. Gil Brandt’s answer is one that Cowboys fans everywhere will agree with. Drew Pearson is one of the greatest wide receivers that is not currently enshrined in Canton, OH. What he did in the context of the time that he did it is quite unparalleled, a point Mr. Brandt made himself. The Cowboys of the 1970s were stacked in a lot of ways and have seen many of their members enter football’s greatest fraternity. For some of the players, however, that is unfortunately not the case. Getting into the Pro Football Hall of Fame gets tougher each and every year with more competition coming all the time and the wide receiver position has seen some all-timers go in ahead of Pearson. NFL Media’s Dave Dameshek summarized the point quite well in the discussion of this all when he pointed out that Pearson’s career numbers are so far behind modern day wide receivers. Drew Pearson will never compare favorably to receivers that played long after him because the game has changed so much from an aerial perspective. His career must be looked at through the prism of what the game was like back then which doesn’t seem to be the case when the Hall of Fame voters get together each year. Here’s hoping that the Class of 2020 does indeed feature Drew Pearson. He’s waited long enough. Chuck Howley is not in the HoF. Pearson, Howley and Cliff Harris are sure-fire HOFers, NO DOUBT. Who was the lead blocker down the field on Dorsett's 99 yard run? Pearson. Hail Mary receiver? Pearson. Winning td catch receiver for the Cowboys in the Atlanta playoff game? Pearson. Stauabach's go-to guy for the pressure first down or td to win a game? Pearson. Undrafted, Tulsa QUARTERBACK who made America's Team as a STARTING receiver. Weighed maybe 160 pounds and didn't go out because of a football injury despite that, took a horrific car accident to do that. Class guy who never got into drugs or abusing women or financial trouble despite all the fame that came with playing for America's Team. Biggest travesty in the NFL he's not in the HOF. Who is the ONLY player on a LOSING team in the SB to get MVP? Howley. Who had multiple PLAYOFF game ints? Howley. Who played 15 years in the NFL? Howley. 6 Pro Bowls, 5 time FIRST TEAM ALL PRO. Started every game 9 years. Players with far less accolades are in the HOF. Harris. Nickname of Captain Crash. Described my HOF coach George Allen as a "rolling ball of butcher knives". 6 time Pro Bowler IN CONSECUTIVE YEARS. 3 time All Pro. Returned kicks and punts, 29 ints in 9 years. Left the NFL at the top of his career to make enough money to not be on the dole for the rest of his life, smart guy. Harris and Pearson are the ONLY two All-70's team member NOT in the HOF. But nooooooooooooooo, there's no anti-Cowboys bias, right?